Interdigital neuroma (sometimes called a Morton's neuroma) is the medical term for a painful growth in the forefoot. The pain is most commonly felt between the third and fourth toes but can also occur in the area between the second and third toes. The exact cause of this problem is not clear. Some studies suggest that it is due to swelling, scarring, or a noncancerous tumor in one of the small nerves of the foot. The symptoms seem to be caused by irritation of the nerve that runs in the space between each toe. What part of the foot is involved? 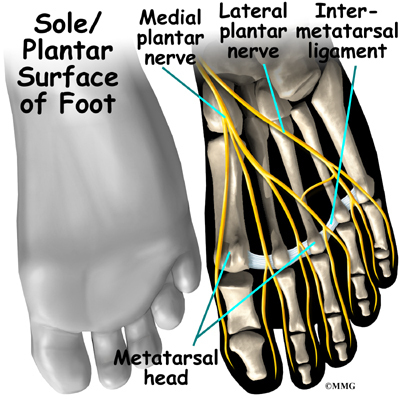 The nerves of the foot run into the forefoot and out to the toes between the long metatarsal bones of the feet. 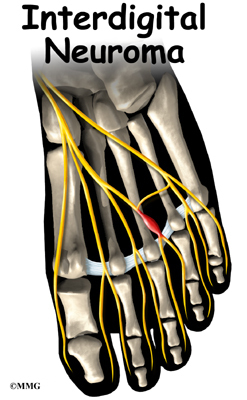 Each nerve splits at the end of the metatarsal bone and continues out to the end of the toe. Each nerve ending supplies feeling to two different toes. The interdigital neuroma occurs in the nerve just before it divides into the two branches, the area under the ball of the foot. A neuroma is formed by the swelling or thickening in this part of the nerve. Why does the condition develop? It is not entirely understood why an interdigital neuroma forms. Most likely, it results from repeated injury to the nerve in this area. Many theories have been put forth as to the cause of the chronic injury, but none has been proven. The most common cause of pain is thought to be irritation on the nerve. The chronic nerve irritation is believed to cause the nerve to scar and thicken, creating the neuroma. Many foot surgeons feel that the problem may arise because the metatarsal bones squeeze in on the nerve, and the ligament that joins the two bones irritates, or entraps, the nerve. Entrapment of the nerve is thought to lead to the chronic irritation and pain. What does an interdigital neuroma feel like? The neuroma usually causes pain in the ball of the foot when weight is placed on the foot. Many people with this condition report feeling a painful catching sensation while walking, and many report sharp pains that radiate out to the two toes where the nerve ends. You may feel swelling between the toes or a sensation similar to having a rock in your shoe. This can feel like electric shocks, similar to hitting the funny bone on your elbow. How will my doctor know it's an interdigital neuroma? The diagnosis is usually made on history and physical examination alone. X-rays are only useful to make sure the pain is not coming from something else. In some confusing cases, an injection of lidocaine and cortisone into the area may help decide if the diagnosis of an interdigital neuroma is correct. This treatment should result in a reduction of symptoms temporarily. 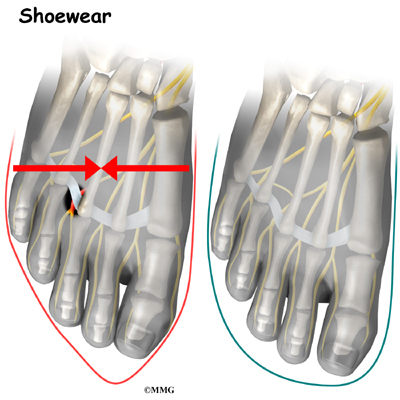 Treatment of an interdigital neuroma usually begins with changes in shoe wear. Sometimes simply moving to a wider shoe will reduce or eliminate the symptoms. A firm, crepe-soled shoe may help. The firm sole decreases the amount of stretch in the forefoot as you take a step. This lessens the degree of irritation on the nerve. Also, an injection of lidocaine and cortisone into the area may help temporarily relieve symptoms. This is usually short-lived (days to weeks) and is mainly useful to help the doctor make a diagnosis. If these nonsurgical measures fail to resolve the pain, surgery may be suggested. There are several different approaches to treating the neuroma surgically. The more traditional procedure involves removing the neuroma. Since the neuroma is part of the nerve, the nerve is removed, or transected, as well. This results in permanent numbness in the area supplied by the nerve. To remove a neuroma surgically, a small incision is made in the skin between the two toes that are affected by the neuroma. 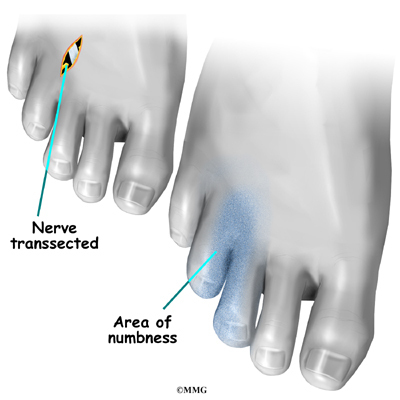 The neuroma is located and removed by cutting the nerve. The skin incision is repaired with stitches and a dressing applied. Many foot surgeons believe that removing the nerve as the initial surgery may be too radical. 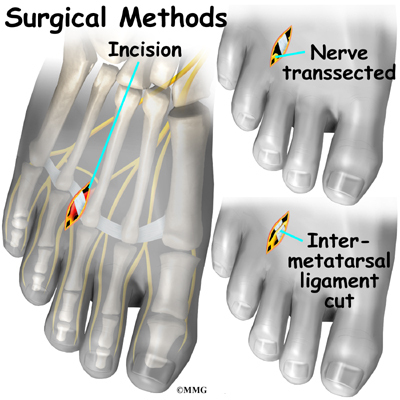 These surgeons suggest that a simple operation to release the ligament between the metatarsal bones will reduce the squeezing action by the metatarsals and remove the irritation on the nerve by the ligament. If this surgery fails, the more traditional approach to removing the nerve can be done later. One of the benefits to this procedure is that you are not left with any numbness in the toes. These surgical procedures can be done either under general anesthesia, where you are put to sleep, or with a type of regional anesthesia. Regional anesthesia means that the nerves of the foot are blocked by injecting a local anesthetic, similar to lidocaine, into the area around the nerves leading to the foot. Only the foot goes to sleep. The surgery is most commonly done as an outpatient procedure, meaning you can go home the same day. Patients with a painful interdigital neuroma may benefit from four to six physical therapy treatments. Your therapist can offer ideas of firm-soled shoes that have a wide forefoot, or toe box. The added space in this part of the shoe keeps the metatarsals from getting squeezed inside the shoe. A special metatarsal pad can also be placed within the shoe under the ball of the foot. The pad is designed to spread the metatarsals apart and take pressure off the neuroma. These simple changes to your footwear may allow you to resume normal walking immediately. But you should probably cut back on more vigorous activities for several weeks to allow the inflammation and pain to subside. You may require crutches for a few days after surgery. The foot will remain tender for several days. The incision is protected with a bandage or dressing for about one week after surgery. The stitches are generally removed in 10 to 14 days. However, if your surgeon chose to use sutures that dissolve, you won't need to have the stitches taken out.